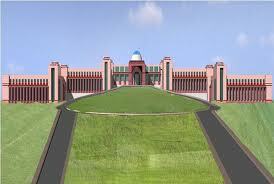 Birla Institute of Technology and Science is a private university in Pilani, Rajasthan, India. BITS Pilani is considered one of the most prestigious and selective universities in India. The university consists of 15 academic departments with a focus on education in engineering and the sciences. Address: BITS, Pilani – 333 031 (Rajasthan) India. Campus: Pilani is located 220 km west of Delhi and 217 km north of Jaipur; the BITS campus is located to the south of the bus stand of Pilani. The total area of the campus (which includes the Birla Education Trust) is over 4 square kilometres (990 acres), but the developed area is 0.2 square kilometres (49 acres) of which 60769 m2 is used for the BITS University building. The campus has class rooms (area 11245 M2) and laboratories (area 7069 M2).Saraswati Temple, BITS PilaniBITS has a Birla Mandir dedicated to the goddess Saraswati, called Sharda Peeth. It was built by G D Birla. The white marble temple is built on a 7 feet (2.1 m) high foundation, with 70 pillars for support and spread across an area of 25,000 square feet (2,300 m2). Pilani Campus has India’s first technological museum called Birla Museum. Built in 1954, it exhibits accomplishment softechnology. BITS has a 2535 m² auditorium decorated with paintings by students. Central library:he library is housed in a state of the art new building, covering about 65000 sft area, close to all academic blocks of the Institute. The library building has a modern design and it provides well lit reading halls, stacks, display area, e-library, audio visual library and study carrels, ramps and lifts etc. It has got attractive interiors and got a seating capacity of 750. Library is fully computerized and the library home page can be accessed all over the campus. About 4000 full text e-journals and many important databases have been made available on the campus network and can be accessed in the Institute buildings, hostel rooms and staff residences. These include the journals of IEEE, ASCE, IOP, ACS, APS, Emerald etc. There are 19 public access terminals in the library. The wireless internet in the library provides internet connectivity even for the readers’ laptops. BITS participates in the INFLIBNET programme of networking the university libraries. Is there IT field in engineering in any of the brancehes of BITS?